The CD which was supposed to carry recordings of Former Minister, MP Ravi Karunanayake giving a statement to the CID the investigations which was produced before courts by the CID yesterday did not contain the said recording. 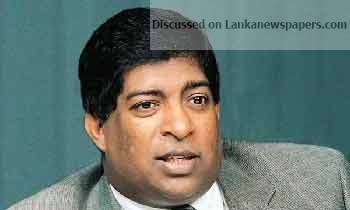 Colombo Fort Chief Magistrate Ranga Dissanayake was therefore postponed for the 10th of this month. An extension of the suspension orders issued on September 14 on obtaining reports on the telephone conversations recorded on mobile phones belonging to nine individuals including Former Minister Ravi Karunananyake and five other court orders at the request of the CID were also expected to be taken up during yesterday’s proceedings. However, the CD provided to courts by the CID in their annexure relating to the orders issued, did not contain the Bond Commission’s findings and accordingly the Magistrate informed the CID that the requested order cannot be given. The CID submitting a motion thereafter stated to courts that the Bond Commission report is a soft copy of a download made from the website at the Presidential Secretariat and when the downloading process was taking place various documents presented at the commission sittings and their copies had been downloaded erroneously instead of the Commission Report. The CID apologised to the court about this lapse on their part and promised to present a fresh CD of the Commission’s findings on a later date. Two CD’s said to contain the recordings of evidence on the Central Bank Bond case given by former minister Karunanayake when he appeared before the Bond Commission on August 2, 2017 were handed over to courts by the CID. The Magistrate, after considering the submissions made, informed court that the order in this respect would be made on October 10 and postponed further hearing for that date.